Been ordering from these guys for the past year and all parts arrived super-fast and in flawless condition. Thanks team Lancer Shop. I Recommend you guys to people who pwn Evolution's in my city. 3P Performance Evo 8/ Evo 9 Radiator Brackets are now available. These are CNC cut from high quality aluminum and anodized for a high quality fit and finish. They are a direct bolt on and will use the factory rubber from the stock radiator mounts. The AMS Ralliart Performance Intake removes clutter and simplifies your engine bay while adding horsepower! The exclusive design improves air flow to the turbocharger, increasing horsepower and performance. Using this intake with a AMS tune we were able to pick up 50 whp. * Gas pedal that is designed specifically for heal/toe shifting. 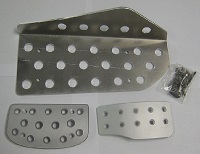 * "Anti-slip" raised edges on all pedals designed to provide a much greater grip than factory or other aftermarket pedals. Take pride in your engine bay? It’s time to take it to the next level with a Titanium Series Dress Up Kit for your engine bay! These kits are a complete replacement for most visible bolts and nuts on your specific vehicle’s engine bay, ready to bolt in as soon as they arrive. What we have here is, a painted to match A-Pillar gauge pod for the EVO. This is full dual gauge pillar pod that mounts *2* 60mm gauges and comes in grey (Stock color) finish. We no longer recommend using oil supply from the cylinder head for the FP GREEN™ for the Mitsubishi Evolution 9 or FP RED™ for the Mitsubishi Evolution 9 in applications that run elevated boost pressures. 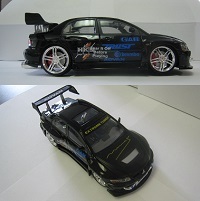 Super rare Evo VIII car model. Does not include box but still on the stand and in excellent shape. We only have 1 of these left and then it will be gone forever! Emblems Are made of High Quality Aircraft Thin Aluminum And Hard Anodized in Color for a Long Lasting Finish . Comes with Self Adhesive 3M Tape for Easy and Simple Installation. Can be Installed in Any Surface Outside any vehicle . 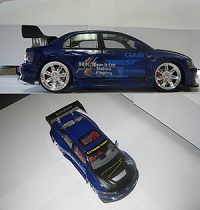 Now is the time to your show your affiliation with the largest Evolution tuner in the world LancerShop.com! This is a black license plate frame ring for your EVO featuring the world famous LancerShop.com logo. Size: 8 in. x 3 in. 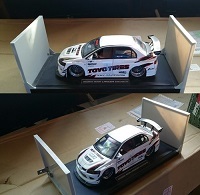 Limited Edition 2003 Lancer EVO 8 mini car. Doors and hood open! Have headlights, interior light, and chassis lights. The Lancer Evolution badge says Evolution IX or Evolution VIII in BIG carbon fiber letters and mounts on the trunk of your EVO. Badge will easily mount on your lancer with the self adhesive material on the back. Mount your gauge in style! If you want the lightest and best fitting carbon fiber vortex generator look no further! Rexpeed spent countless hours tweaking the mold until they were satisfied with the fitment. You can't duct tape your wideband gauge to your pillar, that's why they make this stylish gauge pod. Made from high quality ABS plastic to match factory pillars. This Vortex Generator will fit Evo X MR Touring Model with the flat roof only. It will also fit 2008 + RA model which also has a flat roof. "All exterior glass must remained closed when speeds exceed 172mph" -- This is a great sticker for the interior of your car and lets your passengers know your car is straight race. This decal is yellow and black so it looks OEM, measures 7-7/8" X 7/8"
The Lancer runs rich from the factory, and many of the aftermarket exhaust systems do not stick out far enough to prevent soot and heat damage from occurring. Finally an A-Pillar gauge pod for the EVO that matches the stock interior. This is full Triple gauge pillar pod that mounts *3* 52mm (2 1/16") gauges and comes in grey finish. Finally an A-Pillar gauge pod for the EVO that the stock interior. This is full Triple gauge pillar pod that mounts *3* 60mm gauges and comes in grey finish.